They never said winning had to be pretty. 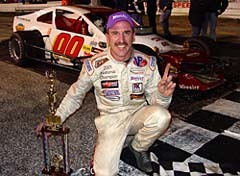 Ted Christopher proved that by winning in a very interesting fashion on opening night for Speedweeks at New Smyrna Speedway. The race was one of two stories; part breaks and heartbreaks. Lia's misfortune made TC's roller-coaster night that much more sweet. Christopher had worked his way through the field twice after tangles and inherited the lead under caution. “When Donny stopped on the front stretch and I'm like oh well... It's better to be lucky than good. That's what Richie Evans used to say. For Donny Lia, heartbreak may not be strong enough of an emotion. Lia stormed to the front to take the lead and looked as it he had the field covered. But then the unthinkable happened. Under caution, with seven laps to go, Lia's #18 stopped on the frontstretch and had to be pushed into the pit area. Donny Lia's #18 is pushed back to the pits after dominating the night's action. 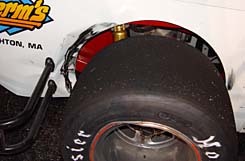 (who finished second) and the contact broke a strut arm on the Brady Bunch #00 and sent Christopher spinning. “I sort of came down on Beers but he wasn't really right there yet,” explained Christopher. “He sent it in on the bottom on the dirt and moved up and slid into me. He got me into Chuckie and got into me. TC's win was obviously an adventure. However, from the beginning the veteran knew he had to use everything he and the car had to get it done. There was some pretty evident damage on TC's car after the race. “When we got banged there we broke the strut rod and I have to give Scott (and the crew) a lot of credit for getting the thing fixed and back out. They gave us a couple of laps right there to get it fixed. 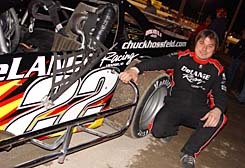 Chuck Hossfeld was driving the wheels off his ROC #22 Mod. The New York driver hit the wall battling for the lead but kept the wheels on it and looked to have a good finish to start Speedweeks. But the lengthy cautions caused Hoss to run out of fuel. “There was a yellow and there was all sorts of oil on the track. I was on the outside of Lia fighting for the lead and I don’t know if I hit the oil or what. We had a loose car all night long anyway. I just got sideways and bounced off the wall. Chuck Hossfeld was fast, but a couple of problems kept him from winning. Remarkably after running out of fuel and all of the attrition, Hossfeld still managed to finish 6th. Eric Beers seems to have everything going right for him these days. The talented Mod Tour and ROC Mod driver was recently named the new driver of the famed Boehler-owed #3 for the 2005 NASCAR Mod Tour season. His good fortune carried into Smyrna Speedweeks. Beers bounced around with several different cars during the night and survived for a strong second place finish. It was the first time the SK Mods had their own race during Speedweeks at New Smyrna Speedway. With a full-field of Mods in the pits, track officials decided to run the SK's separate from the Mods (they usually run together). The SK's started 13-cars with Chris Jones taking the win. The Mods started 18 cars in their feature. JR Bertuccio's Gershow Recycling Trailer was in the pits, but the door remained shut all night and there was no sign of the Long Island hot shoe. Other Long Islanders in the pits told Speed51.com that JR and his father were in North Carolina and would be in Smyrna for the second-night of racing.